You just want to download videos from YouTube. Well, and to convert the videos to watch on your iPod or cell phone. Or maybe to another video type. 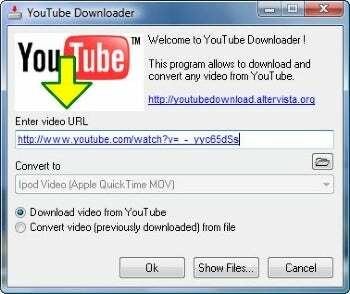 That means you want freebie YouTube Downloader. It runs as a small applet and is exceedingly simple to use. Copy the URL of the YouTube video into it (you'll find the URL on the upper right-hand side of the video page in YouTube), then tell the program to do its work. You'll be able to choose your destination folder and name of the downloaded video. Conversion is similarly easy. Choose the downloaded file you want to convert, then choose the download format and click OK, and the work is done. You can convert to many different formats, including for the iPod, iPhone, cell phones, PlayStation Portable, as well as common PC formats including MPEG and Windows Media (.wmv). Given that all this is free, what's not to like? Note that when you install this software, by default it will install the Yahoo Toolbar and make Yahoo your default search engine. If you don't want that to happen, make sure to uncheck the boxes before installation.